The owners of BAY STREET COTTAGE wanted a quiet get-a-way spot that would still be close to local activities. They found it in this adorable two-bedroom, one-bath cottage, with fenced yard and nice size deck on a quiet side street in Boothbay Harbor. THE HOUSE: The recently updated cottage offers two bedrooms, one bath, WiFi, Flat Screen TV, Gas Grill, open deck and fenced yard in a quiet neighborhood. Just a seven-minute walk across the footbridge will have you downtown or at Barrett Park where you can kayak or swim. Craving Lobster? Take a stroll on down to Atlantic Edge, or stop by one of the other local Lobster Co-operatives, to bring back and enjoy out on the deck during sunset. Perhaps you'd like to relax in the living room and enjoy a good movie on the flat-screen TV. In any case, pack your bags, leave the cares at home and come to enjoy a week here on the coast of Maine. Enter from the front porch on the first floor into the full kitchen complete with stacked washer & dryer in the closet. The open dining/living room area is arranged to be functional and comfortable, with plenty of natural light from the large slider doors opening out to the side deck. This cozy spot is perfect for relaxing and enjoying Maine's wonderful weather. One King Bedroom, one Full Bathroom complete the first floor. The second floor is one spacious bedroom with one King bed, air conditioner, and seating area. NOTE: Bringing a furry friend? The fenced yard is perfect, allowing your family pet to have a safe place to run and play. LINENS & TOWELS INCLUDED? No, linens and towels are NOT included, however, they can be rented through us (for a fee) or brought from home. Pillows and blankets are provided. BEDROOMS: (1) King on the first floor, (1) King on the second floor. BATHROOMS: (1) Full bathroom with shower/tub combo, sink & toilet on the main level. Downtown Boothbay Harbor offers many restaurants, shops, art galleries as well as the essentials like banks and post office. With so many fun activities to do and interesting places to see, you'll want to be out and about every day! From Boothbay Harbor you can take a Puffin Cruise, go Whale watching or sail on a Windjammer, just to name a few. Rent a kayak right in town and explore the Harbor and outer islands by water. 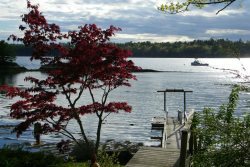 The Boothbay Peninsula is a beautiful region rich in culture, history, all things nautical and of course it’s own unique niche in nature. The area offers ample opportunities for biking, kayaking, canoeing, fishing, charters, and guided cruises, spas, a championship golf course, and country club, mini-golf, bowling, museums, antiquing, hiking and walking trails. We have the Maine State Aquarium, the Coastal Maine Botanical Gardens and the Boothbay Region Land Trust with its 30+ miles of pet-friendly trails in protected areas. Off-Season Arrival and Departure dates may be flexible. Better than we expected Very comfortable, we'll equipped in every aspect. Your team was excellent. Audrey, Richard and Lucy attended to all our needs. I completely love my visit! Bay Street Cottage was a delight. Everyone has been great to work with. Very competent group. Thank you. Very personal and helpful, thank you MELBA!!! AIR CONDITIONING!!!!!! We really appreciated having Air Conditioning. I realize the residents of Maine don't think it's necessary, but in the middle of summer, we really enjoy it, and feel it's a necessity. We were very comfortable at this property, felt like home. Did I mention THANK YOU FOR THE A/C?? "We choose Cottage Connection because it was very easy to search rentals and find the information we needed to book a cottage. They provided lots of information for us to make our decision about where to stay. I would say to friends and family "you need to use Cottage Connection to find your next vacation rental because they are great". "I think your service was great. When I called you answered my questions, provided all the information I needed about the cottage, your procedure of picking up the key and getting directions and returning key were easy, and I would definitely recommend Cottage Connection to any of my friends." "We enjoyed our stay in Boothbay Harbor in the Bay Street Cottage during the week of August 15 through Aug 22, 2015. The best part of our vacation was being able to walk from our cottage to downtown Boothbay Harbor, but still be away from the crowds"
Driving Directions & Lock Box Code will be sent to the guest, via e-mail, once their reservation is finalized by signing the Short-Term Occupancy (Rental) Agreement. Swimming Area Rating 0/5: Not a waterfront property, however, Barrett's Park (beach) is just a short drive or walk from the property and that gets a 5/5! Privacy Rating 1/5: in-town home, in a quiet neighborhood.